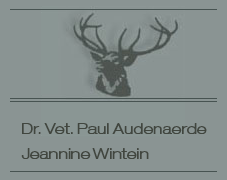 In 1989 our first red deer arrived at the Marquettepolder farm. They had been delivered by the late Gerald Walker from the Maplehurst farm in West Sussex, England. Gerald remained a friend ever since until the day he died. Today sika and fallow deer are also bred along with the red deer. Yet, these are actually pets and do not represent any commercial activity. Raising red deer has become our passion and producing top quality our primary goal. We have had orders a.o. from the Netherlands, France, the Czech Republic, Spain, Latvia, Greece, … The farm owner and manager has drawn a lot of advantages from his veterinarian degree with reference to breeding and diseases, which also benefits customers. Quality of the trophy, which we appreciate as the production of animals with heavy, wide and long antlers. We pay far less attention to the production of multipointers. We use exclusively bloodlines which have been successfully selected by hunters in nature for many years and which have consequently become famous because of the desirable genes they carry. 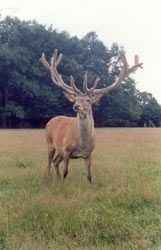 Our master stags are direct descendants of several central European bloodlines, a Danish, a Swedish and an English one. Deer from former Marshall Tito from Yugoslavia, now Croatia. These deer have specifically long, heavy antlers which are however rarely multipointed. End 2017 we bought 18 pregnant hinds from the enclosure of Franz Weber (Germany), whoms deer are known to carry heavy, stockish, multipointed antlers. Our Belgian farm, the Marquettepolder, is situated in Lapscheure (Damme) north of Bruges and just south of the Dutch border. Our French farm is le Bois Clairet, Journet (Department Vienne), 30 miles east of Poitiers. The latter is our main breeding farm for our red deer. It comprises 68ha, all serving as territory for our animals or as fields where we produce their winter feed.